Oblique-branded dart (Potanthus rectifasciata) f5, iso 1100, 1/200ths, pop-up flash. Nice head and eye, but too shallow depth of field. I am no expert when it comes to macro-photography. I don’t have the patience to set up all the equipment needed to get the perfect shot. Rather, I like to mooch about looking for interesting things – usually butterflies, insects, spiders and plants – to photograph. I like to keep moving and see what I come across. 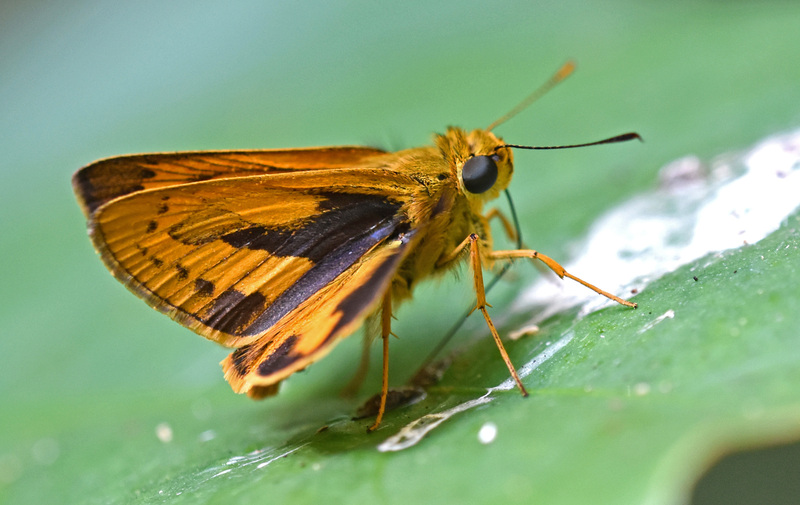 The patrolling strategy rather than the perching mode, to use butterfly terminology! I lug about a fairly ordinary Nikon SLR camera attached to a fairly decent macro lens (Sigma 150 mm) and for the most part don’t use flash. I do have a flash gun, but mostly I use the pop-up flash on my camera if I need to, and mostly it works OK. But I prefer to use natural light if I can; I prefer the overall effect, even if you do lose some of the detail. Oblique-branded dart (Potanthus rectifasciata) f5.6, iso 640, 1/125ths, no flash. Nice of fore-wing but too shallow depth of field. I am still an amateur: never sure what is the best setting to use! I am always changing settings and playing around with different combinations: sometimes to disastrous effect! Sometimes I push the depth of field (DOF) – which has the effect of boosting the auto ISO setting – but this often gives too grainy an image without flash. I often use the custom controls on the camera; I like the ‘Sport’ setting which gives a nice sharp image, but looses DOF! You can’t win with photography! Oblique-branded dart (Potanthus rectifasciata) f5.6, iso 720, 1/125ths, no flash. Rich colour but not enough depth of field. I am more interested in capturing animal behaviour (which usually needs a relatively high shutter speed), than with obtaining a perfect image Well I would like both really! 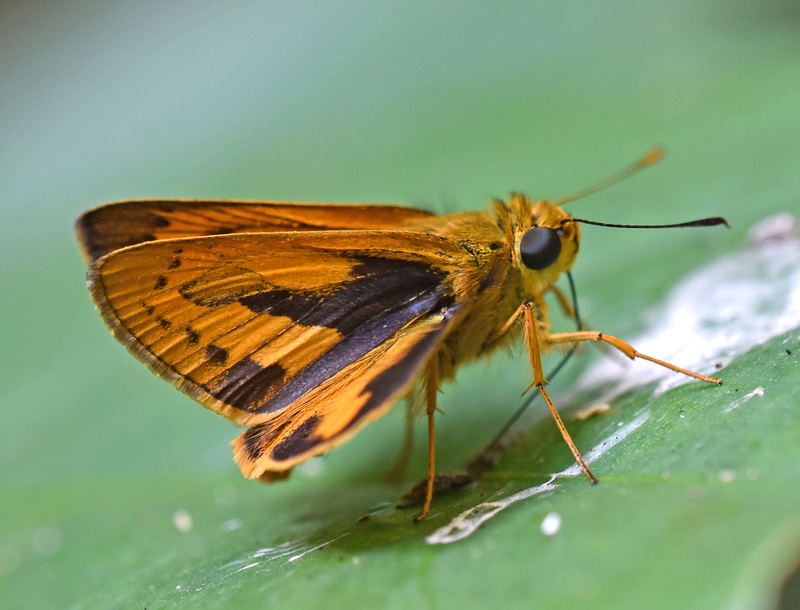 I came across this little skipper in a patch of forest beside the road, on the way up Mt. (Doi) Sutep, near Chiang Mai in Thailand. 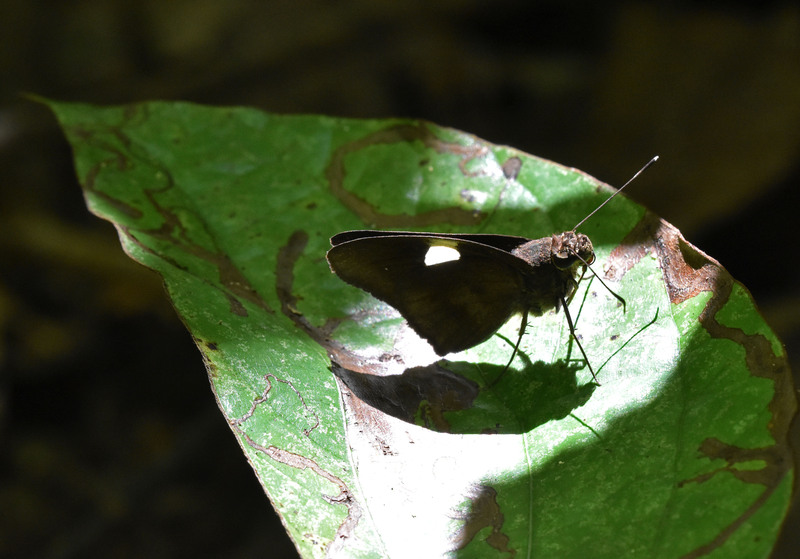 The butterfly was preoccupied with ‘puddling’ – and recycling its wee! – on patch of dried bird dropping, on a leaf, and allowed me to approach it quite closely. I sat or lay on the ground, occasionally changing my position to get a different angle. I probably would have done better with a flash gun, to be honest, but there is a certain freedom in just working with a lens. So I relied on the camera setting a high ISO number, up to 12,800 in images with a DOF of f18, but only ISO 640 in others at a lower f-stop. I used a relatively low shutter speed (1/250th or less) throughout, because the insect was not moving very much. To be honest, I don’t think it made much difference. I would probably have been better shooting them all at a moderate DOF of f8. The most important thing is to hold the camera and lens well – firmly to minimize camera-shake – and take lots of pictures. Luckily, modern lenses have excellent image stabilizers! 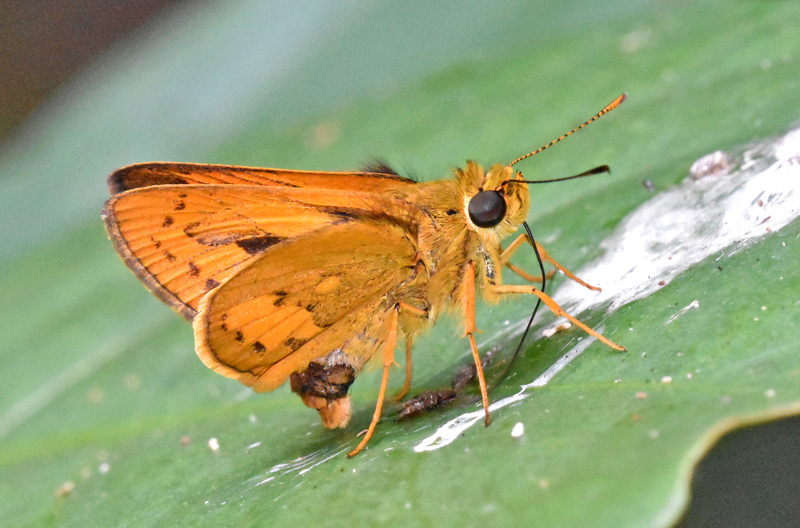 Oblique-branded dart (Potanthus rectifasciata) f5.6, iso 800, 1/125ths, no flash. Nice colous but not enough depth of field. 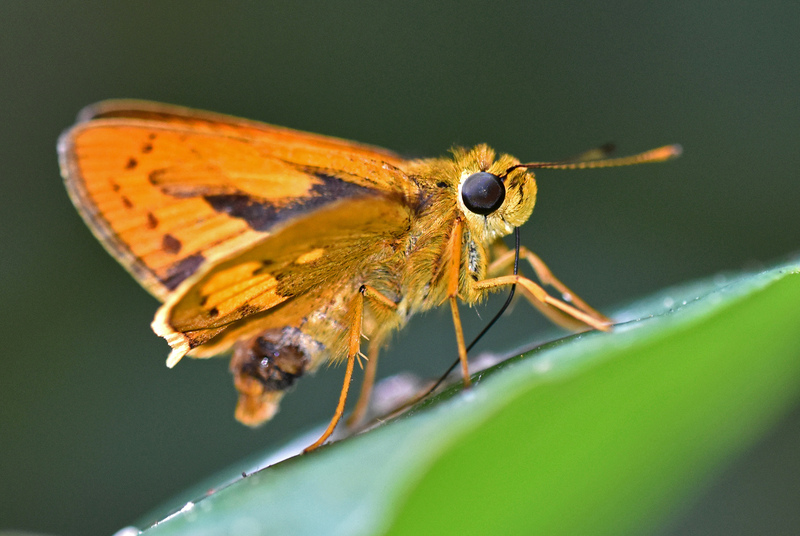 The butterfly is moving slightly all the time, changing the position of its body and the angle of its wings. So to get pictures of the different parts and postures – fore-wings, hind-wings, side view and so on – it is better to take a lot of shots from different angles, than to try and get a prefect shot which has all parts in focus. That is almost impossible without gluing it to the leaf, in my opinion! I really enjoy taking pictures of an animal like this! You never know what you will see and what you might find out. In this case it was ‘recycling behaviour‘ described in a previous blog. One is granted a privileged glimpse into a different world. I always have great expectations of how a set of photographs will turn out – rarely met! – but one can dream of getting a great photograph! Oblique-branded dart (Potanthus rectifasciata) f18, iso 10,000, 1/250 ths, pop-up flash. Way too grainy. There is no doubt that there are huge limitations in not using a flash when photographing such small subjects; but call me old fashioned! I still quite like the effect of natural lighting, even though the images are not going to win any competitions! I suppose it really depends on what you are trying to achieve: a fabulously detailed photograph of a butterfly, or a more artistic shot showing the animal in its natural environment. It is probably just a matter of taste, and it is very easy to pick and mix, to turn the flash off when you think it might be better without it. I’ll finish with an image which I think works well using natural light. The details of the butterfly wings would no doubt have been picked out and highlighted by fill in flash, but sometimes the dramatic effect is more important than detail and accuracy! And I am a scientist speaking!! Clavate banded demon (Notocrypta clavata) in sunspot on leaf. No flash. Chiang Mai, Thailand. The sun came to my rescue! Finally, to show you what a really superb photograph (of this species) looks like have a look at this image by Antonio Giudici. It shows the advantage of a really good flash light, together with a good (f16) DOF. I guess I need to up my game! Your images are great Ray don’t beat yourself up. I never use flash and as we have discussed before I set my Nikon to aperture priority, set my iso and let the camera decide the shutter speed. Dof will depend on size of subject, angle to focal plane and the effect I want. If shutter speed drops too low I up the iso, this I have control of by the fn button. Macro lenses will always have shallow dof when you are in 1-1 even if you boot the f stop way up. If you want good dof step back and crop the image, Sigma lenses capture superb detail ! I’m so glad I’m not the only one that ‘s happier to capture images of subjects ‘au natural’ than to strive for perfect portraits! Your images are always great and your narrative and descriptions really bring your subjects to life. I always learn something from your posts, thank you! 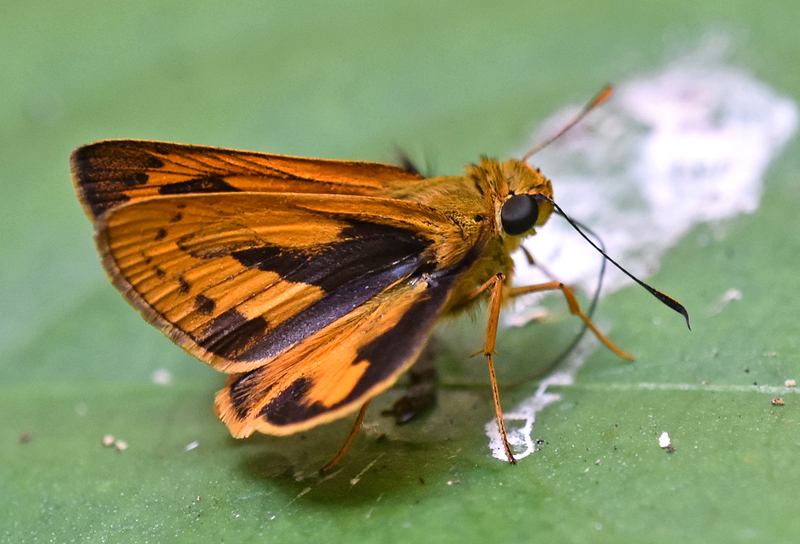 Ray Cannon's nature notes Portrait of a skipper – to flash or not to flash!